Google spreadsheets: Neat, but necessary? 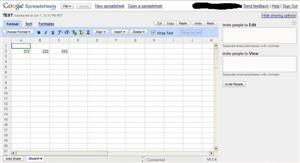 Google recently rolled out their online spreadsheet application in a limited test. (I signed up the day after the fact and got my “invitation” within hours.) While it’s certainly a neat demonstration of what can be done with Web 2.0 applications nowadays, I have trouble finding its spot within the Google hierarchy. But don’t get me wrong. It’s a very well-done spreadsheet application, and has a very good desktop-feel to it, a fact that is all the more significant considering it’s a web application. Spreadsheets can be saved, either to Google’s servers or to your local system, and *.xls and *.csv files can be uploaded as well. A nice set of regular desktop features such as cut/copy/paste and undo/redo are also included. The standard formatting options are also present, along with formulas, of course. 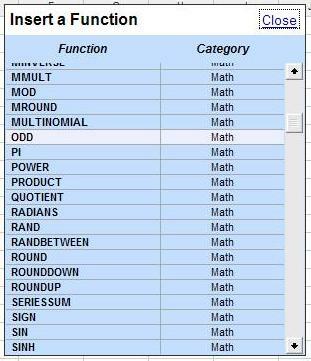 A significant selection of built-in math functions are also available, besides the usual SUM and AVERAGE functions. All of this makes Google spreadsheets a very complete, but basic, spreadsheet program. Google has also added the ability to share spreadsheets with other users, and one can also chat with current users who are also looking at the same spreadsheet, a move in the direction of increasing collaboration. Perhaps it will be (or already has been) integrated with Google Talk. However, this does not make it an Excel-killer, nor a killer of any real desktop spreadsheet, for that matter. Even if you consider that Google may just be wanting to “get their name out there” for as many products as possible, this service is not the way to do it. Firstly, there are no graphing or charting options, making it relatively useless for lab students who will inevitably have to produce a graphical version of whatever data they’re working with. Perhaps this will be added in the future, but until then, this will be a severe limitation. Secondly, there is virtually no incentive for anyone with a desktop spreadsheet to switch to Google’s online version. True, you may be able to access your data easier with Google Spreadsheets, but with online storage services already available, this may be a moot point. Also, there is the question of privacy – would you really want to be using an online service to store sensitive records? Additionally, even if the online service equalled its desktop counterparts, companies would have a tough time switching after having invested so much on standardization on Microsoft’s products. Also, as mentioned over at Micro Persuasion, there is no search feature, as of yet. For a company such as Google, this is somewhat unbelievable. It’s almost as if the service was launched just to show what is possible with web technologies nowadays, without considering whether it was really needed. It may seem that Google is trying to chip away at Microsoft’s share of the office market, what with their SpreadSheet application and their purchase of Writely, an online word-processor, but in reality, I don’t see web services like these taking over traditional desktop suites anytime soon. (E-mail clients versus web-mail are a different story) I think Google would be better off continuing support of OpenOffice, and maybe consider incorporating these online services as some sort of package with OpenOffice, perhaps as “OpenOffice online” or something similar. Additionally, there are also many online spreadsheets out there, such as: Num Sum, iRows, EditGrid, and Zoho Sheet. Many of these offer more features, (such as the missing chart and graph options mentioned before), and offer right-click menus as well, further adding to the seamless experience. However, don’t mistake my criticisms for a lack of appreciation. I greatly admire what Google has been producing, and because of their big presence and keen interest in new technology, they’ve done much within the past few years to promote and rollout new Web 2.0 applications. Google SpreadSheets is very much well-done application, and one that is a step in the right direction, towards usable (and hopefully useful) online applications that are seamless with the desktop environment.